Cornbread is a bit of a Southern Staple. Marrying a Southern guy, you've kind of got to get your cornbread fixing skills down pat. You've got a couple of different types of cornbread - your fluffy cornbread, your crunchy edged soft middled cornbread, your super crunchy allover cornbread - and that cornbread your Grandma makes that nothing can ever stand up to. When you live in Kristy's world - you also have your healthy cornbread - and ohhhhhhhhh is it good. This cornbread is fluffy with slightly crusty edges - and it's super adaptable. 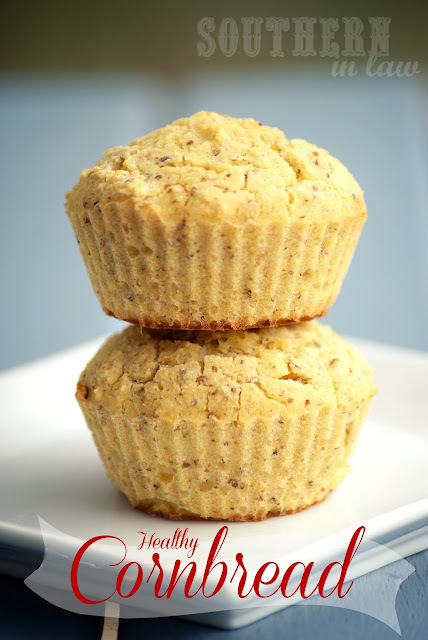 Jesse thought you couldn't make cornbread without butter - but when he tried these healthy cornbread muffins (not knowing what they were made from) he thought they were delicious! They are slightly sweet (but that's how good cornbread should be, according to Jesse) but contain no sugar, only natural sugars from the applesauce. It's also a vegan and eggless recipe, which means it can be enjoyed by many. Optional: I added in some ground flax to this batch for a little something extra and it was delicious! Feel free to add in whatever mix ins you feel like. Mix in your applesauce, adding enough water/milk to combine all ingredients and form a thick batter. Pour your mixture into your muffin tins/loaf tin. For a cake/loaf tin: Cooking time depends on the size and thickness of your loaf - in a small loaf tin, my mixture took ~30 minutes, however, keep an eye on yours! 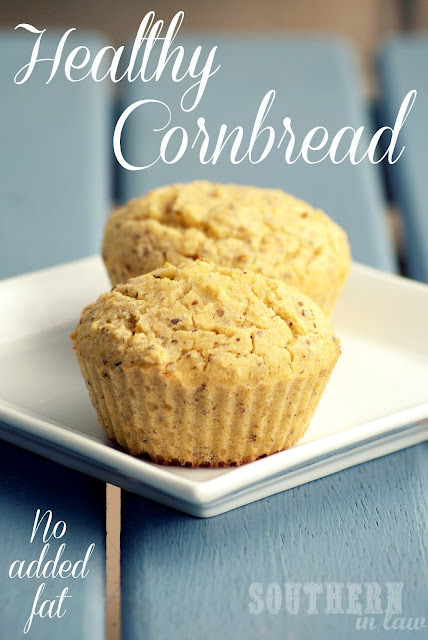 So tell me, are you a cornbread fan? Ohhhh my goodness. Kristy, these look phenomenal!! I can't believe you only needed applesauce and milk -- amazing! We mainly eat cornbread with chili, but I think it deserves to be the star of the show (err, dinner table?). Unfortunately, my guy disagrees... He needs a little more meat than that! They are really good! I actually used this batter for a Tamale Pie - I just put chilli in a ramekin and poured a bit of the cornbread batter over the top and baked it in the oven - so so good! They're delicious! They have a little bit of a different flavour, obviously - but still so so good! Beautiful pictures of the muffins!~~I love my cornbread sliiightly sweet too, but with a hearty and dense texture to it yet moist and chewy on the inside. I also looove it when it has corn kernels throughout the dough--so good! Jesse told me I should try making a Mexican cornbread and mix through chopped jalapenos, cheese and corn kernels, so I'm going to do that soon! i wonder if brown rice or tapioca flour, oat flour would work well with these.. what do you think? You'd have to mix together the brown rice and tapioca flours or you'd end up with super crumbly cornbread (and possibly gritty). I haven't tried it with oat flour, but it may work - you're safer to use some added gluten free flour to help it bind though. Do you think it would work if I used whole wheat flour instead of the plain flour and added fresh corn kernels from some incredibly sweet corn I have? Would I have to adjust the baking time (or anything else)? Hi Naomi, you can definitely use whole wheat flour, however, they may be a little crumblier. If you added some fresh corn, I'd definitely just keep an eye on them as they bake and perhaps use less water/milk. Let me know how you go - and be sure to take a picture so I can add it to our reader showcase! I don't think you want a picture. Something definitely went wrong. The taste is good - the kernels added a nice crunchiness and some extra sweetness - but the texture is all wrong. They didn't rise at all so they're like hockey pucks - sweet, crunchy hockey pucks :) I think the whole wheat flour might have been a mistake or maybe I needed more liquid - I added 1/2 cup of oat milk but the batter was still very thick. Any other ideas of what went wrong? Oh no - this is one of our favourite recipes! If I add flax seed, how much should I add? Hi Kristy. Is there anything other than applesauce that can be used? Hope u can help. Thanks! Hi Shannon, you could use pumpkin or banana - but it would change the taste and texture. We only make it using the applesauce so I don't know how anything else would work! Oh yay! I'm so glad you liked it! If you happened to take a picture, be sure to send it through so we can add it to our reader showcase! Do you think if I add yogurt instead of applesauce it would work the same way? Hi there, to be honest I'm not sure how it would turn out - using all yogurt can sometimes make baked goods a bit gummy. You could definitely try it, but I couldn't vouch for the results. I have, however, tried using pumpkin or banana instead of the applesauce and they both work. I just made these cornbread muffins. They are DELISH!!! I had one drizzled with molasses for my breakfast! what about whole what PASTRY flour?